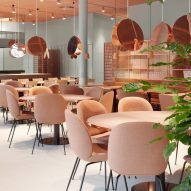 Note Design Studio has combined deep orange marble fixtures with peachy-hued furnishings inside this Stockholm hotel to foster a comforting atmosphere for tired travellers on business trips. 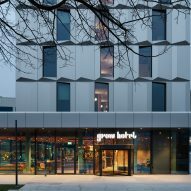 Located northwest of central Stockholm close to Solna Strand metro station, the Grow Hotel has been designed by Note Design Studio to feature spaces that are "warm and rich in expression". "We imagined the weary business traveller, on the road for 150 days a year, getting out of a taxi from Arlanda [airport] with his or her carry-on case on a rainy night in November. This hotel shouldn't feel cool or luxurious, it should make the guest feel taken care of," explained the studio. 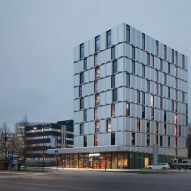 The hotel contains 176 guest rooms, a gym and a sauna, all of which are set inside a faceted metal building created by Danish architecture practice 3XN. Upon arrival, guests walk through a lobby that doubles up as a restaurant – an attempt by Note Design Studio to avoid the "big, open and often empty" entrance areas that are typically created within hotels. Named Norobata, the restaurant offers Japanese-fusion cuisine and practices robatayaki – a cooking method in which food is cooked at varying speeds over hot charcoal. 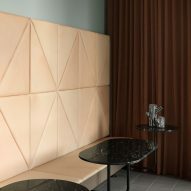 A block of brick-red Alicante Rosso marble forms the reception desk counter, complemented by burnt orange dining chairs and leather seating banquettes that run along the room's peripheries. 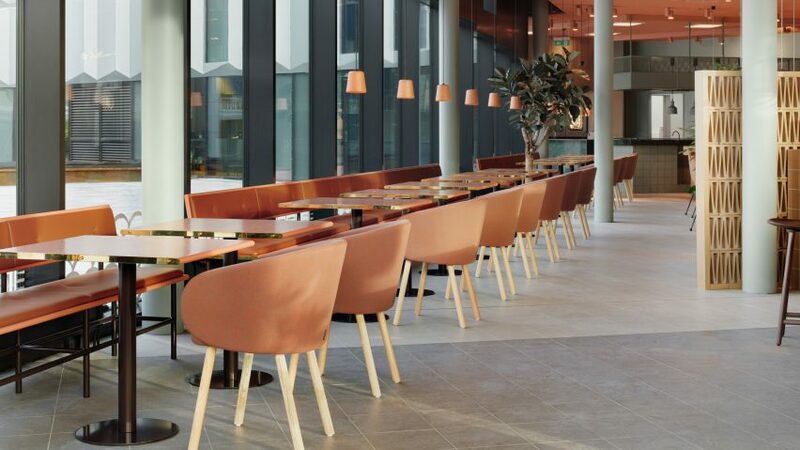 Disc-shaped pendant lamps made from copper have also been suspended above. Peach-coloured sheets of perforated metal have been used to line the ceiling and create storage units where bottles of wine or spare glassware are kept. 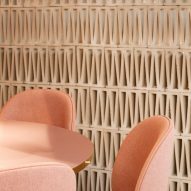 Extra touches of warmth are provided by brass-edged tables and a handful of timber partition screens that have been cut to feature a zig-zag pattern. 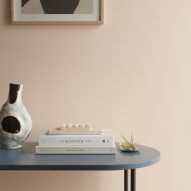 "We wanted to create a journey through the hotel starting with an energetic, social and warm lobby and restaurant all the way to the rooms which have a cooler and more minimalistic tone," Johannes Carlström, co-founder of the studio, told Dezeen. Adjacent to the restaurant lies a small kitchen where guests can cook together or make meals with the help of a professional chef. This area has been completed with sea-green marble surface counters and jade-coloured light fixtures. Upstairs in the guest rooms, which are fronted by full-height windows, surfaces have been painted cool shades like off-white and slate grey. Panels of light-hued timber have been applied on the lower half of rear walls to form headboards. Some of the rooms have been designed as long-stay suites, complete with their own kitchenettes. This is the first time that Note Design Studio has worked on the interiors of a hotel. The Stockholm-based studio is led by Cristiano Pigazzini and Johannes Carlström, and has recently revamped a fashion store to feature metal, coloured glass, and marble surfaces, and created an installation comprised of artificial snow dunes. Other hotels around the Swedish capital include At Six, which is set inside the former headquarters of a bank. Photography is by Jonas Lindström.